The benchmark is the Zend/bench.php that lives in the PHP sourcecode (run ten times for each version of PHP using the php7dev VM on an average laptop, and then the mean result for each version calculated). The script runs through a series of taxing algorithms, giving a sense of how quickly a series of computational instructions can be executed. So by this measure, PHP 7 is much quicker than any of the PHP 5 family. Looking at the adoption rates of PHP , many readers may well be on PHP 5.3 which is why it's included in the graph (if you're still on PHP 5.2, then you need to go back to my 5.4 benchmarks to see that in context of the other versions) - but the performance increase will be remarkable for all PHP 5 applications when they adopt the new platform. The absolute numbers here don't mean a lot but the relative performance of the various versions should hold true. What About Real PHP Applications? Real PHP applications will always vary but already there is a lot of data available - the best set by far is in Rasmus' slides, where he shows a selection of open source projects and measures the requests/sec that they can handle on various versions of PHP. You can find those here: http://talks.php.net/fluent15#/drupalbench (and keep arrowing right). How Realistic Is It To Upgrade? Realistic. The PHP 5 to PHP 7 platform upgrade is going to be easier than the PHP 4 to 5 upgrade was, and many applications did that successfully. I'd also say that going from PHP 5.5 or PHP 5.6 to PHP 7 is easier than going from PHP 5.2 to PHP 5.3. To upgrade: your first step is to get to PHP 5.5 or PHP 5.6. Seriously. No PHP 7 for you unless you go there first. PHP 7 isn't stable but it still absolutely needs your input, no matter who you are or what your skill level. Try running your application and all its tests on PHP 7 - it's the master branch of https://github.com/php/php-src/. A really easy way to get started is to use the ready-made VM here: https://github.com/rlerdorf/php7dev. Check what extensions your application uses, then make sure they are listed here https://github.com/gophp7/gophp7-ext/wiki/extensions-catalog. If not, add them. If they're not ready for PHP 7 yet, we have lots of resources to help you to compile the extension yourself and help us work out what needs doing to make sure they are ready for when you will need them. PHP 7 is looking great, but it won't be successful without our input. Yes, the benchmarks are impressive, but if you're still reading, thankyou. The input of the community to do simple, non-scary-internal-C-code things, just to run code and verify what does and doesn't work, will make the difference between a smoother, sooner launch, and a disaster. Let's get to it. This entry was posted in php and tagged benchmark, benchmarks, php7 by lornajane. Bookmark the permalink. Another step to help test your apps on PHP 7 and detect compatibility problems early is to add PHP 7 to your testing matrix if you use Travis CI. the php5 hack fixes are really meaningful although you have to be careful with deferencing. I always wondered why did PHP completely skip a version 6 branch? This is a common question. At one time there was a plan for PHP 6 and books published about it and everything - then we changed tack and some of that work became PHP 5.3 (this is why there is such a big gap between the PHP 5.2 and PHP 5.3 release dates). 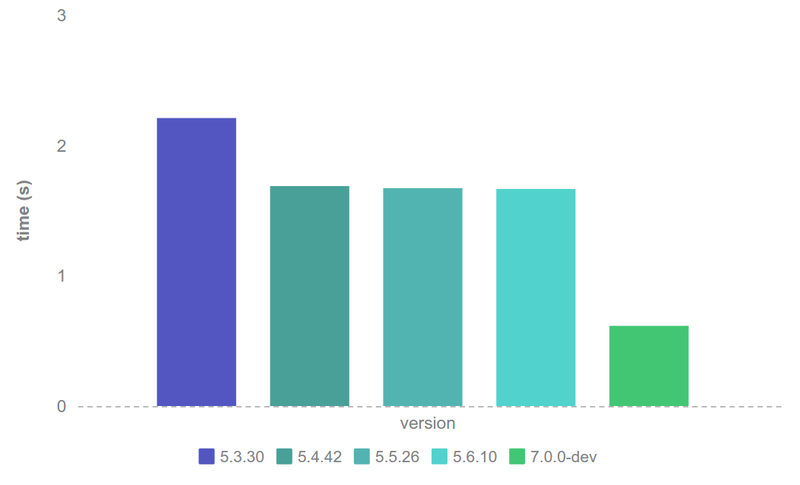 When we were ready for the next new version, we felt it was confusing to have a completely different version 6.0 so it was bumped to 7.0.